The injunction to Keep Calm and Carry on, with or without various mutations, has, in recent years, become ubiquitous. ‘One of the most recognisable slogans in British history’, as Henry Irving notes, it can, in modern English, be found inscribed on anything from mugs and cards to clothing or bags. Its origins as slogan have been carefully located in WWII, being credited to the shadow Ministry of Information. As Simon Eliot explains, almost three million copies of a MOI poster urging the populace to ‘keep calm and carry on’ had been distributed across the British Isles by the early autumn of 1939. It was, nevertheless, to be a notably short-lived campaign. A crisis of confidence– founded in concerns that it might seem patronizing or even annoying – led to its swift demise. Originally intended to strengthen the war-time spirit, and to reassure as a new war began, the posters were – with a few exceptions – pulped in 1940. Slogans, however, also have beginnings and “carrying on” – as a specific injunction to maintain war-time resilience, and with particular reference to qualities of fortitude on the Home Front – already had a long (if forgotten) history. Devising their poster in 1939, the shadow MOI drew, in fact, not on a blank slate of language but made use of what was already an established collocation of war-time use. Based in WW1 rather than WWII, the determination to “carry on”, had already featured prominently in a wide range of private and public discourses. As war began in August 1914, uses of carry (and carry on) were, as we might expect, plentiful. Carry on had already been given three senses by Samuel Johnson in his Dictionary of 1755; the recent entry in the first edition of the Oxford English Dictionary (in a section published in 1888) had expanded this to five. Discussion of the need to carry on the war, to carry on work, or to carry on the fight or struggle are easily found. Carrying on is made a serious business often collocating with words of industry and labour. As in the example below, uses of this kind required a direct or indirect object. 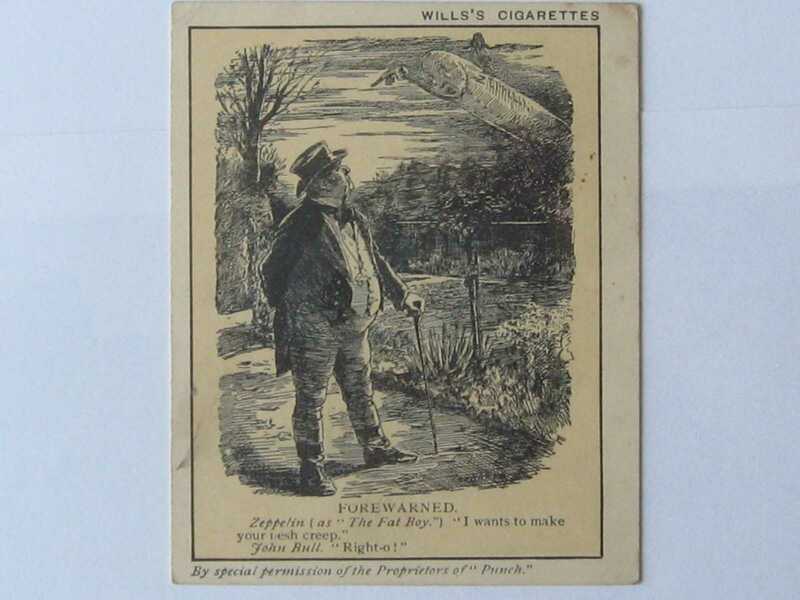 Particularly prominent, however, are uses of carry on as it came to be used in another early motif of WW1 – here in the expressed determination to carry on business as usual, an idiomatic expression often credited to Winston Churchill though it was, in fact, used by Lloyd George as early as August 4th. Importantly, this construction signalled much more than a commitment to maintain the national economy, being deeply imbued with the morale-boosting resolve to maintain quintessentially British ways of life on the Home Front, irrespective of what the war might bring. Business as usual already had its own linguistic history (being in use in the 18th century). Coupled with carry on, however, it came to express a war-time mind-set, a state of ideological resistance – founded in a determination not to give in, and to continue unaffected, however bad things might become. as an advertisement for Iron Jelloids – identified as an ‘invigorating tonic – hence demanded in September 1914. Churchill, using this phrase in November 1914, was – to use a modern idiom – merely making use of a current meme. As in the Jelloids advertisement, business – and the duty to carry on is embedded in ‘everyday duties’, whatever they might be. By implication, anyone and everyone could participate in this national endeavour, and in the spirit of war-time resistence. No more stern test of any man’s mettle could be imagined than he should have to “carry on” when death is doubly present in the mines below the water and the shells bursting above’…Those fishermen, too, who have continued to follow their calling have found that “business as usual” has not been without its added risks. Carrying on here links both to the role that has to be performed, but also to the appropriate mind-set of performance – the resolve, courage, dedication, which ‘business as usual’ (which here includes mine-sweeping) might require. an article in the Times stated to similar effect in November 1914. In examples of this kind, carrying on exists in its own right, yet inferentially continues the sense of patriotic resolve of business as usual — not least in the expressed determination to be uncowed by circumstances, whatever these might prove to be. As here, advertising could – as so often in WW1 – prove highly adept at appropriating war-time diction for its own ends. ‘We’, collectively, are encouraged to ‘carry on’, whatever this might involve – since in a nation at war, not least in one which, by 1916, involved both combatants and non-combatants as objects as attack, all are – literally or metaphorically, ‘behind the guns’. Endurance — on a range of levels — was vital. I have seen little more than the headlines in newspapers which announce “Mobilization of the Women”. I suppose it means that, at the last pinch, women must prepare to “carry on” while the men have gone to the wars in Flanders and elsewhere. You will ask what they are doing now if they are not “carrying on.” For the children still have their breakfasts and their marching orders for school, the mysterious world of the household goes forward, the daily adventure of shopping, the daily achievement of the dinner-table. Yet the Board of Trade must require more, or it would have sent out no circular. …The Amazons are no extinct tribe. Here, if certain domestic things still happen in the established patterns of the past (and therefore, by definition, “carry on” or continue in the older senses of the verb), what is now additionally to be carried on is of a very different order. The resolve and determination that women must now exhibit – in departing from their accustomed roles – is key, here invoking a state of patriotic engagement and a willingness ‘to do their bit’ in compensating for the loss of male labour. Carrying on can mean committing – with proper patriotic resolve and endurance – to the wider life of the nation, in ways which were –for many women– unprecedented in earlier years. Again, however, it is the attitudinal response which is made most significant, over and above the ways in which this might – in individual circumstances – now be realised. More is at stake than merely carrying on the hoeing. Carrying on could, for the duration, therefore become a way of life, offering a range of well-established precedents for ‘Keep Calm and carry on’. As in the advertisement below, here from January 1918, carrying on was made into an effective linguistic symbol of resilience. Two short words could, with striking economy, be made to evoke the war-time spirit, with its complex layers of commitment and resolve, patriotism and endurance, as well as a refusal to give in, especially on the Home Front. Worried by the condition of his wife’s health, a private of the Oxfordshire and Buckinghamshire Regiment tramped from Salisbury to Birmingham to see her. He was arrested, taken to Portsmouth as an absentee without leave, and ordered detention in barracks. While in the cell he climbed to a high shelf, and refused to descend. When the doctor was called subsequently he fell, fracturing his spine, and died at the military hospital on Thursday as a result of the fall. A verdict of accidental death was returned at the inquest. The aim behind Clark’s ‘Words in War-Time’ project was to look at language, history, and their interrelationship, at close quarters. While the Oxford English Dictionary applied historical principles to language from 1150 to the present day, Clark aimed to look at language, and history, as it happened – testing historical principles in the everyday and as prompted by what gradually emerged as one of the most significant historical events of the twentieth century. A range of words can, in different ways, reveal, and confirm, change in progress (in language and war alike) in the autumn of 1914 – confirming, too, Clark’s intuitions about the salience of observing language in a period of unprecedented historical change. Shrapnel, mentioned briefly in an earlier post, was, for example, particularly interesting in the changing patterns of use that Clark’s early notebooks reveal. This had, in fact, been one of the most recent entries in the OED as it then existed. 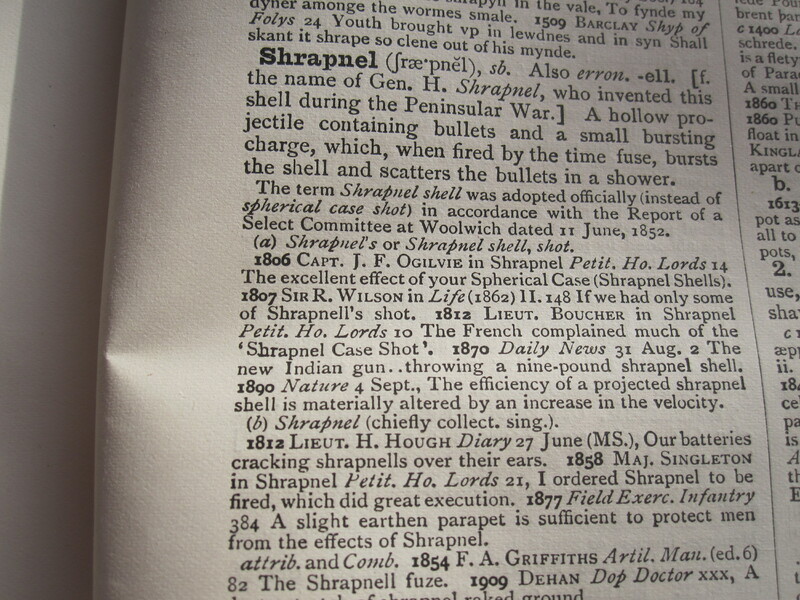 The relevant section of the dictionary had been published in late March 1914; as the image below illustrates, the history of shrapnel was tracked from 1806 when the inventiveness of General Shrapnel in the Peninsular war gave his name to this new mode of attack and defence. Shrapnel, the OED wrote, was ‘A hollow projectile containing bullets and a small bursting charge, which when fired by the time fuse, bursts the shell and scatters the bullets in a shower’. As this definition indicates, the shrapnel is the casing, and the contents are the bullets. Constructions such as shrapnel shell, as in the quotations from 1870 and 1890, make this meaning particularly clear. As a panoramic scene the engagement was beautiful. The day was cold and clear. The city, particularly the cathedral, stood out in bold relief in its little valley, while the shrapnel exploded above it in balloon-like floating white puffs. Occasionally black smoke rose where the siege shells burst. My first view of the fighting was shrapnel bursting about the beautiful two-steepled cathedral’. As soon as the French infantry deploy their ranks and appear in the open they are met with showers of shrapnel, which also is not as deadly as it looks from a distance. Then follows the hurried “tat-tat-tat” of machine-guns from the woods and spinneys, and then the long rattle of musketry from the trenches along the ridges. Shrapnel in the last two examples is transferred to the bullets which fall with lethal force to earth; in the former, it is a ‘splinter’ – designating the ‘bits’ that shells contain rather than the shell per se (although this may, of course, also signal the ‘bits’ of the disintegrating shell). As the final example confirms, however, shrapnel can also be used without the specifying bullets to indicate the mode of injury and attack. In the autumn of 1914, Clark can therefore reveal the play of meaning and changing familiarization of this word as both noun and adjective. For a time, in popular comment in the autumn of 1914, shrapnel can ambiguously designate both whole and part, projectile and the hostile contents of the shells which sailed overhead. By the end of October, the OED entry of six months earlier was therefore distinctly out of date. History – and language – had moved on. Shrapnel had not only one sense but three. If meaning begins, historically, in a single type of shell, it swiftly extends, during the terrible familiarization of WW1, to denote the contents of that type of shell. As war advances, however, it can, in turn, lose its reference to this specific shell-type, designating, more broadly, the devastating contents of bombs, together with the kinds of widespread injury they cause, as in compounds such as shrapnel wounds, shrapnel injuries. The meaning ‘Fragments from shells or bombs’ is ‘Now the usual sense.’, as the modern OED notes, dating such use to October 1914. ** As Clark confirms therefore, while General Shrapnel — in yet another eponym of English — gives his name to this spherical projectile, it was language in use along the front, and by soldiers rather than generals, which instead gradually changed the patterns of signification which remain in use today. ** The revised OED entry can be seen at shrapnel, n.” OED Online. Oxford University Press, September 2014. Web. 1 December 2014.